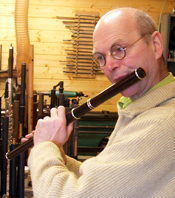 News, articles and updates relating to the Irish flute maker Martin Doyle. This recently published video clip is a cover of the Massive Attack classic Teardrop as performed by the Irish flute player Eimear McGeown on a Martin Doyle keyless D flute. A lovely piece beautifully performed by Eimear who gets great tone from the flute. A cover of the song Teardrop by Massive Attack. Demo Version produced by John Tonks. Arranged by Eimear McGeown and John Tonks. Eimear McGeown – Irish Flute. Anna Jenkins – Violin/Viola. This entry was posted in African Blackwood, Irish Flutes, Martin Doyle Flutes, Music, Musicians, Video Clips and tagged Anna Jenkins, cover, Eimear McGeown, John Tonks, Massive Attack, Teardrop on 5th February 2015 by Admin. Martin Doyle is an Irish flute maker whose simple system wooden flutes (aka Irish flutes) have become renowned for their ease of playing and quality of tone. Born in Dublin, Ireland, Martin Doyle grew up in the seaside town of Bray in County Wicklow. One of four children in a family with music in their blood, Martin was influenced and inspired by his mothers melodious singing from a very early age – learning songs that have stayed with him to this day. Humour: Our Only Saviour! | News - Martin Doyle Flutes on Happy Birthday Ronan Browne! Two Great Men Came A'visiting | News - Martin Doyle Flutes on Happy Birthday Ronan Browne!